The HealthRider Pro H500i treadmill offers some advanced Interactive Cross Training Workout programs that control the speed and incline of the machine automatically while you do the sweating. It also comes with a set of hand weights for targeting the upper body muscles. (This is the “cross training” concept: cardio + weight training = total body fitness.) HealthRider treadmill reviews are favorable for this machine because of this unique feature. UPDATE: The Pro H500i model is no longer available. 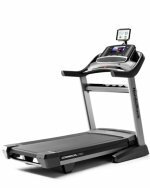 You can check out all of the new treadmills for sale at the Healthrider online store for special deals. While the treadmill motor is skimpy at 1.75 CHP, the short and narrow tread belt will seem very small compared to other treadmills. Experts remark how the presence of a thickly cushioned belt usually puts strain on a motor, making it burn out that much faster, but HealthRider overcomes that situation, at least somewhat, by installing a narrow, short belt. This won’t be a problem for a small person, but an average size or larger person will feel oddly out of sorts on the HealthRider Pro H500i. Consumers who aren’t widely educated about fitness training are happy to stumble upon a treadmill that features a set of hand weights plus offers the audio/vision in-console program to coach them through a weight training workout. This muscle-toning feature, added to your cardio workout, is an innovative way to get a total body workout. We found the HealthRider Pro H500i to have a small walking area, quiet motor, excellent cushioning, above average reliability, but a weak parts warranty. The motor warranty is industry standard (10 years) which is a plus, but the motor is nothing special and will give you problems sooner rather than later. 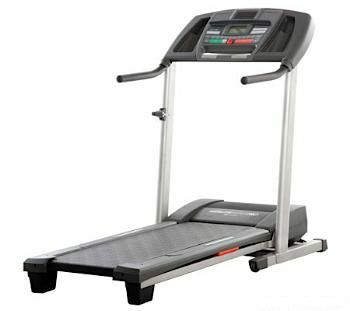 For $699, the HealthRider Pro H500i treadmill offers fairly good value for casual walkers, but for a bit more money you could buy a Sole F63 or one of the lower end Smooth treadmills.